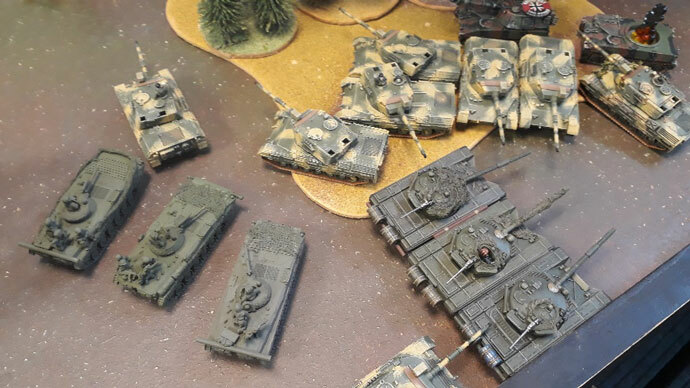 Tournaments have been a staple of wargames since the dawn of time, or so the cliché goes. That was certainly the way over here in Scotland for many years, from the Nationals; where the best players in the country got together to battle it out, down to in-store tournaments attended by a couple of players. More recently though, we have been moving away from the traditional tournament idea, more towards characterful, community-based ‘Organised Play’ sessions. These OP days brings players together from around the country to play against other players they’ve maybe not met before, never mind played. So, the idea for Red Tide Rising kept this going. Coming off the back of the widely enjoyed Firestorms: Red Thunder and Stripes from this year and last. The idea was to cram the entire experience of the Firestorms into a single day of gaming, across three games. Utilising the Firestorm: Red Thunder map, we recreated the entire engagement, compressed into nine games. We were sadly stuck for space at Common Ground Games (no bad thing, it only shows how popular the venue is), and only had space for eight players. We had a last moment cancellation but pressed ahead with six, with myself reduced to umpire duties. 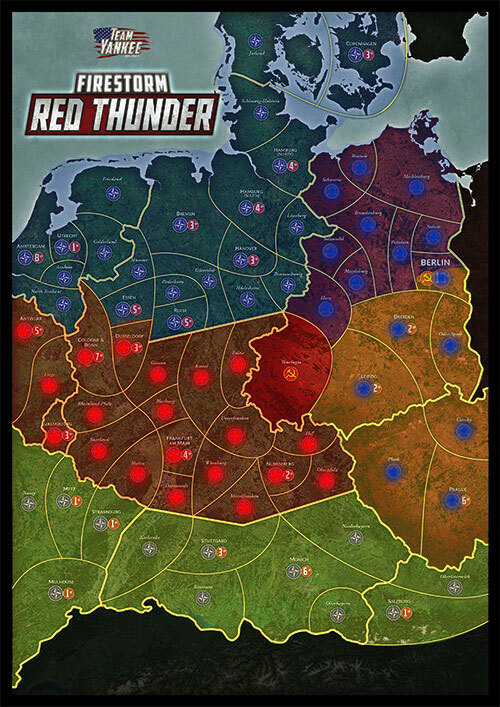 As we were playing three games each, the Western part of the map would be taken large swathes at a time, compared to the Eastern area, with Berlin being the target for the NATO counterattack, while Warsaw Pact would be pushing for Amsterdam, Antwerp, and Metz. 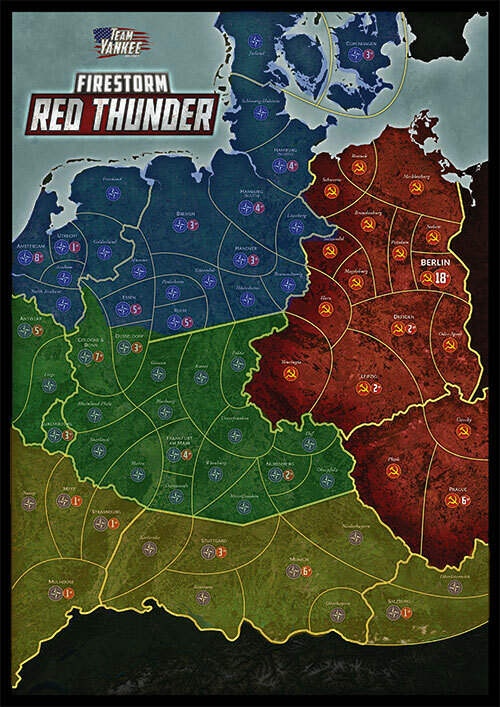 The use of the Red Thunder map was only the beginning, as some characterful events were added to the campaign. 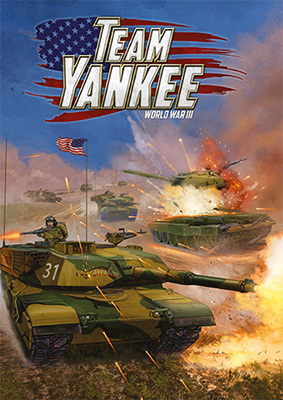 Taking inspiration from the Flames of War command cards, one-use advantages, or disadvantages were added to the games to reflect the changing tides of fortune in the war. The rules were not fully tested, so may have proven to be imbalanced, but as the games will show, they seemed to have a good and effective impact on the games. We then kicked off, with Shaun and Kenneth elected as Supreme Commanders for each side, choosing where each player would battle. The first matchups were determined by the NATO side positioning their forces, one to each sector, before the Warsaw Pact side deployed their forces against each one. This way the Warsaw Pact side may have gained a slight benefit of being able to match up against opponents they may have an advantage over. The Warsaw Pact player may, after deployment but before turn one, conduct one artillery bombardment using the stats from a 3-gun Carnation battery. This bombardment counts as ranging in on the first attempt but does not leave a ranged in marker. One unit from a compulsory choice (not including HQ units) increases their Morale to 2+ for this game only. The unit is chosen in secret, but noted, and revealed after the artillery bombardment from the Warsaw Pact Player. 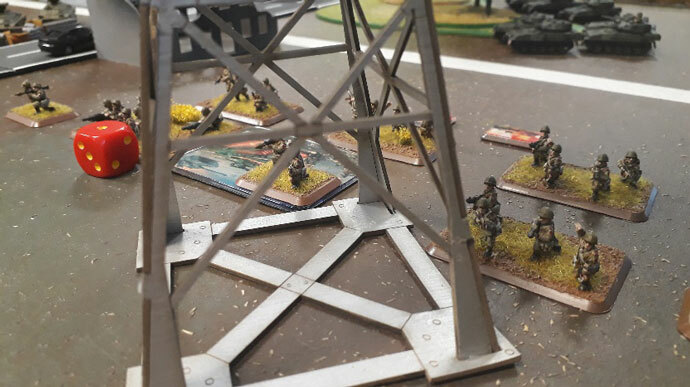 The reports from the frontlines relayed that the special rules given to each side were balanced, though the Soviet bombardment was quite ineffectual, with very few casualties reported amongst the NATO defenders. The Morale increase for the NATO players also did not come into effect all that often, with the only NATO loss coming from losing an objective, and not in fact by morale. The effect of these battles resulted in the Soviet thrusts from the North and South being blunted and turned back into East Germany, while the advance through the Centre took Hof Corridor and Fulda Gap without much trouble, pushing West towards Frankfurt. The first Morale check taken by one of your compulsory choices, but not HQ, is passed automatically. You may not use the Spearhead special rule. You may re-roll your first Reserves roll. The feedback from the above advantages and disadvantages were again, that they were not game-breaking, and added a little bit of variety to the game. 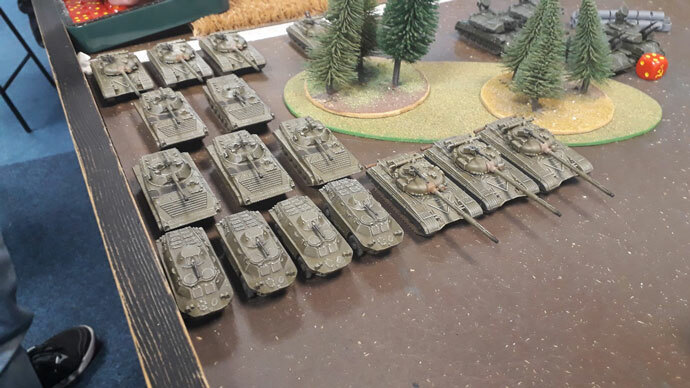 The NATO player not being able to use Spearhead meant that they were rushing for position, while the Warsaw Pact player having their morale reduced meant they were more careful with that unit. In terms of results, the thrust through the Centre continued, while the NATO forces of North and South were now knocking on the door of Berlin. It all comes down to the final game. Once during the game, one compulsory unit (but not HQ) may re-roll failed ‘To Hit’ rolls during the shooting phase. One unit in your army (Not Strike Aircraft), reduces their Morale by ‘-1’, and may not take advantage of any Formation Commander’s Morale. One compulsory unit may re-roll their first failed Morale Check for not being in ‘Good Spirits’. Once per game, one T-72, T-72M, T-64, or T-55AM2 unit may fire at Halted Rate of Fire 2. If attacking, the defender may place an additional minefield. If defending, you may only place two minefields. Players once again relayed that the Special Rules were interesting, but sometimes didn’t come into play. (One of the Warsaw Pact players kept his tanks moving, and so couldn’t benefit from the increase to Halted Rate of Fire). But, how did the final trio of games go? With Berlin threatened by the advancing NATO forces, but with Antwerp also within the sights of the East German spearhead bearing down on Belgium? So, what does this mean for future events up here in Scotland? Tournaments will still happen, as players like to test themselves. But, we will also be embracing this form of ‘Competitive Organised Play’ a lot more, and with the teaser for ‘From Stalingrad to Kursk’ building excitement for the upcoming Eastern Front releases, I can foresee the Soviets and Germans clashing again; this time the Germans being the antagonist. And no doubt that the six who fielded forces for this will return eager to add their support to the team effort that this sort of event encourages. And hopefully they’ll be joined by another few players, who will be welcomed warmly. Firestorm: Red Thunder was the first of two global campaigns where players could refight World War III in Europe.